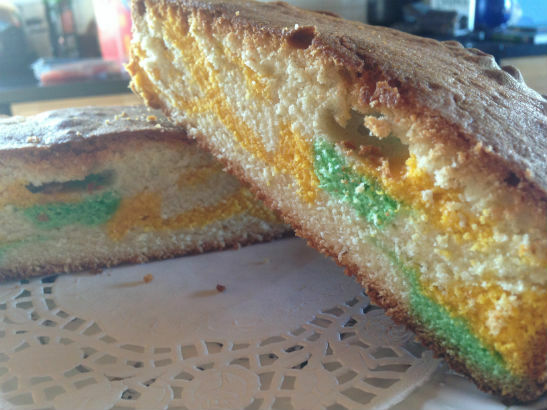 A Marble Cake is essentially a brightly-coloured Madeira Cake. You can add whatever colours and flavours you wish: chocolate, orange, mint, vanilla or strawberry. It’s funky, delicious and impossible to say no to. Prepare a deep seven inch round cake tin with greaseproof paper. Mix the caster sugar and margarine in a bowl. Sieve in the flour and fold into mixture. Add the milk and mix again. Separate the mixture into small bowls. 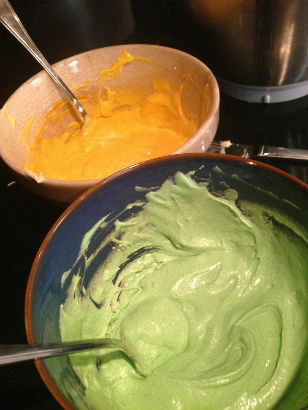 To each bowl, add a different food colouring, or the vanilla, or the hot cocoa mixture. Place alternative tablespoons of each mixture into the tin but do not mix them together. Bake in the oven for one and a quarter hours. Turn out onto a wire tray and allow to cool before eating.